You are sitting in a room full of strangers. Strangers to the left, strangers to the right — your seat chosen at random and companion elsewhere in the crowd. A screen at the front of the room intermittently flashes up images of a plain hotel room, dated and sad. Words then silently tell you that the speaker should be with us shortly. And then, darkness. Not dark. Not unlit. Absolute, pitch-black darkness. In case of any confusion, let us state this very clearly: you cannot see a thing. 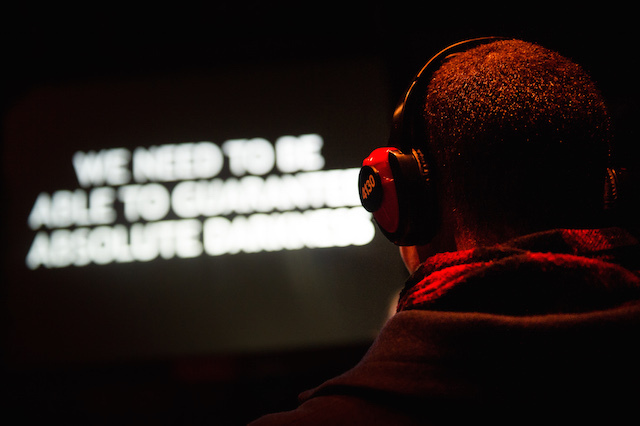 Fiction at Battersea Arts Centre is the second binaural sound performance by Glen Neath and David Rosenberg (the first being Ring, which was originally staged a couple of years back), where audience members don headphones and give up their sight for an hour. The effect is disquieting, disconcerting, and at times overwhelming. Binaural recordings cleverly replicate sound as it is heard in real space, meaning that our sleep “companion” Julie (for surely, we are now asleep) is whispering gently in our left ear just as other characters within our hotel-world dreamscape are talking in the distance over to our right. Lift mechanics crank overhead, ornaments smash behind us, and rain gently patters the roof of our car. Sound confusing? It is. We are transported from location to location, character to character, only able to rely on our own hearing to guide us (although we think they may also have injected scents into the room at certain points). And if we are suppressing the storyline somewhat, that is because it is non-linear, disorientating and very much open to interpretation. Rather … dream-like, in fact. Too much emphasis is put on physical discomfort — sudden crashes and almost overwhelmingly-loud churnings have us squirming in our seats. Obviously there is an intent to challenge the listener, but we feel that the intellectual challenges were more successful than the physical ones. For example, the moment when a character questioned whether our car roof was still there, simply because the rain had stopped, was an enlightened touch. Fiction is weirdly compelling. We would have liked to have our heads messed with more — a bit more thought-provoking than body-jolting — but at £15 it is reasonably priced for such an absorbing experience. Fiction is at Battersea Arts Centre, Lavender Hill, SW11 5TN until 21 March. Tickets cost £15/£12 and can be booked online. Londonist saw this show on a complimentary review ticket.